JR, the now-famous artist recently recognized with the 2011 TED prize, once plastered the rooftops of Kibera with close-up images of womens’ faces. 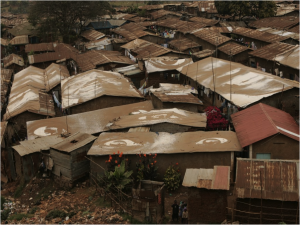 The striking images often featured in our presentations about Map Kibera, because without knowing anything about the artist or the intent, shack rooftops covered in human visages resonated with what we hoped to do with our work: make the “invisible” visible, and humanize the apparently inhuman slum. A recent New Yorker article provides interesting insight into JR’s work. JR is now undertaking a massive project of printing out other people’s self-portraits on jumbo poster paper so that their own images can be plastered like graffiti around their communities, or elsewhere. He is, in a sense, taking the concept he started out with in Kibera and other marginalized neighborhoods and taking it to its logical conclusion: creating an army of graffiti-artist self-portraitists. Though he tried to practice his art in secret by hiding his identity and using renegade graffiti methods, it still earned him personal fame and fortune – turning the world’s attention back on him. It seems he’s again tried to push the lens back to the people he photographs, by serving as their printer. Whether it will succeed is not yet clear; to me the images start to look like a giant paper Facebook. But the example led me to consider further the meaning behind self-representation in a slum. While building the various tools of representation in Map Kibera – creating a map, video, or blog post about oneself – the main thing everyone wanted to know was, but what changed in Kibera because of it? Even just a few months – or weeks – into the project. Representing oneself visually, online, on video, or on a map was considered a means to a specific end. Rightly so, I thought. But, in fact, might it be considered disempowering to require that because self-representation is happening in a setting like an African slum, it must achieve measurable development “outcomes”? Is pushing the development agenda along standard pathways minimizing other reasons for expression, ignoring the need for local ownership of information and news, or forcing a process of open-ended exploration by participants of what they hope to achieve to end too soon? There is a subtle difference between standard urban development or activism and the way that new media allows for what’s been called networked organizing. I’ve thought about these questions a lot while going between the world of development and the world of art, a rare border-crossing I’ve made at venues like Ars Electronica and Picnic. Did people challenge JR the same way? It’s possible that they did, but because he’s positioned as an “artist” rather than a technologist or a development worker, the expectation isn’t there. The impact is in the change of perception, in the laying of claim to ones environment, in the increasingly common ability to declare, this place is “me”, or “us.” It’s not the same as ownership, but a form of it nonetheless. Again, it’s a way of asking, whose reality counts? Who does this place belong to? Perhaps along the lines of Occupy Wall Street, there’s a calling to witness, a reckoning, a question long before the hard work of hammering out answers can occur. The mental shift before the physical. Maybe coming from the development paradigm, we didn’t consider this a viable option. The core business of development has generally been to either impose, inspire, or create change (depending on your point of view) in circumstances, structures, and environments where conditions are intolerable on one level or another (that is, most of the planet). The core business of art, well, that’s up for debate but its often seen as an end in itself- the change effected by art is subtle in the mind of the observer and artist, even when the art itself is strongly polemic. It’s not supposed that direct action need be taken but that a collective mental shift occurs. In the article, JR mentions that people in places like urban slums are more and more sensitive to the way they are portrayed in the media. They are increasingly aware – and angry – about misperceptions. We have found that everywhere we’ve gone people are extremely motivated to control that image – and in so doing, control their environment. Once they’ve begun to take charge of their image, and become engaged citizens – yes, there’s a call for change, a call for results. And I still believe it’s useful to create information with a purpose – to map and write about specific topics while linked up with community groups that are active, in order to call for certain changes and guide planning. But I’ve also seen that there is a thrill of discovery – of engagement – that naturally comes with turning a camera or GPS on your own backyard, which needs to be valued. It’s a matter of saying, as with JR’s work: Here We Are. Repeatedly. And only once heard, to ask Now What? Now, if you dig a bit deeper, you do find that even JR seems to have gotten caught up in this murky area. He’s started a foundation of some kind (the New Yorker doesn’t bother to explain, as though this is the simplest of things – to give some money to a slum) to help the places that he’s photographed in some way other than through his art. I can only imagine what happened in Kibera – where people are hyper-aware of the money to be made off their images, and those of their children. Any foreign photographer is not accused of getting rich off “art” (the concept being blatantly inconceivable there) but getting rich off selling someone’s image – possibly caught in a less than proud moment – to NGOs who then are seen to profit. Nothing done in such a setting comes without moral strings attached, often pulling in different directions. This is the heart of the matter. I’d like to suggest that we outsiders working in development (especially in new media) think a bit more like artists, giving those who make representations of themselves the freedom to decide what their stories “mean” – even more so when new open tools are being employed and certainly the world at large has not figured out everything they are capable of. Our job, perhaps, is to protect the internet from control and censorship, and promote access, continue to work to open and flatten this arena. That’s not to let the artist off the hook. I wondered what was the real story behind JR’s posters. Did people balk at his camera? Did he have to explain, pay, or at least befriend them first? What’s the story of that encounter? And what do they think of him now? In Kibera, we found that he had to buy – and may continue to buy – his roof space from the residents who live beneath it. Art, like journalism, about a place that is not one’s home is always a matter of negotiation and examination of audience and purpose. There is not one interaction in image-making – perhaps, in all of development – that isn’t morally fraught. But isn’t it more interesting to let that be the starting point for real discussion of the meaning and goal of self-representation?